Light snow will kick off the start of the weekend, but any accumulating snow for the Stateline looks to remain low. 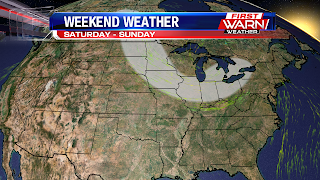 Low pressure moving in from the west Friday will lift into the Upper Midwest Friday afternoon and evening. Accumulating snow will develop ahead of the low during the afternoon, impacting mostly northern Iowa, Minnesota and Wisconsin. 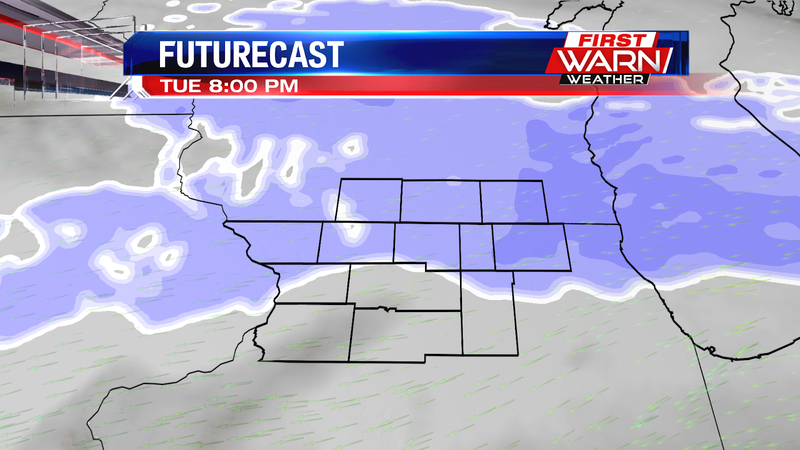 The best chance for snow in the Stateline will occur north of Highway 20 during the late afternoon and evening. 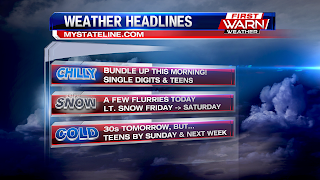 The snow won't be much and shouldn't cause many issues heading into Friday night or Saturday morning. 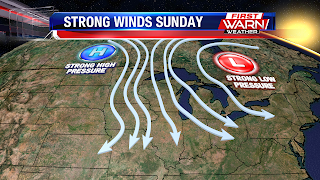 A stronger low pressure system will develop over the southern Plains Saturday afternoon and evening, moving south of Illinois during the day Sunday. An abundance of moisture will bring heavy rain and thunderstorms along the southern states, but snow stretching from parts of the Plains into central Illinois. 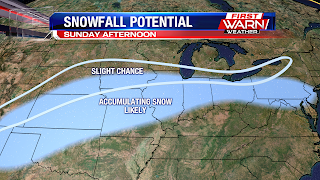 Looks like most of northern Illinois and southern Wisconsin will be on the northern edge of the snow Sunday, with only a few light snow showers likely - especially south of Rockford. Following the low an extremely cold air mass (for the beginning of March) will settle south into much of the country. 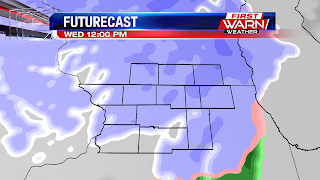 This will push temperatures nearly 20-25 degrees below average for the start of the week. Much of the overnight and early morning hours were partly to mainly clear. 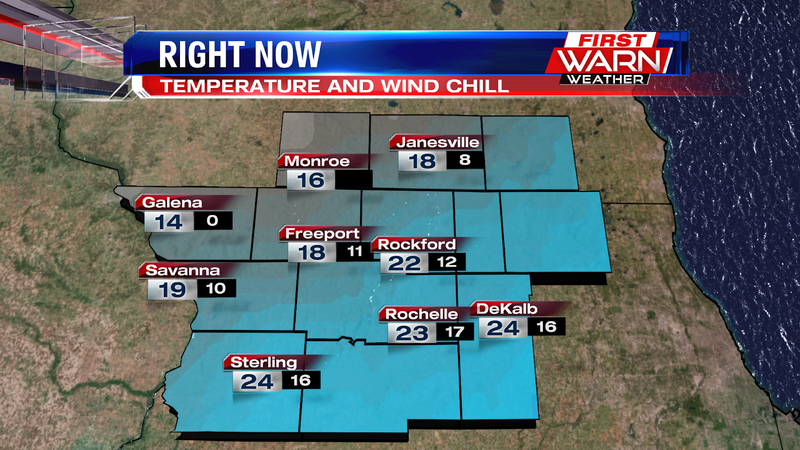 This helped low temperatures to dip down into the single digits and lower teens across the Stateline. Here in Rockford we made it down to 10°. Clouds have build in over the last several hours, and it has become overcast across much of the region. Some light snow is starting to show up on satellite and radar. 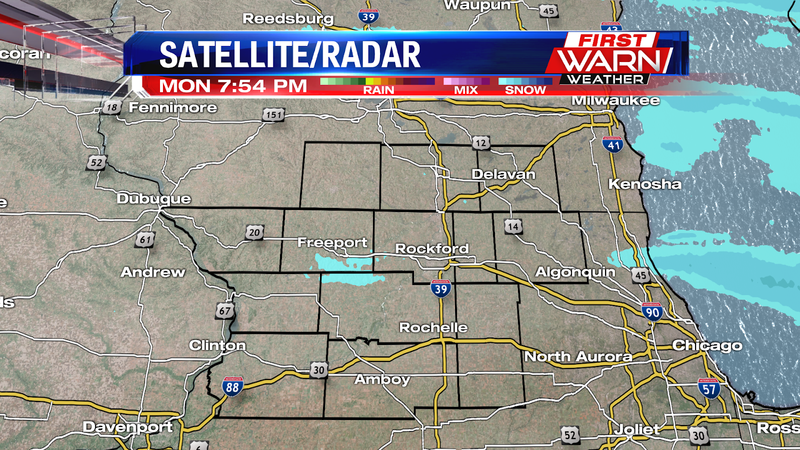 Looking at observations off to the west, some of the snow that is showing up isn't making its way to the ground. For instance, Waterloo isn't reporting any snow falling. 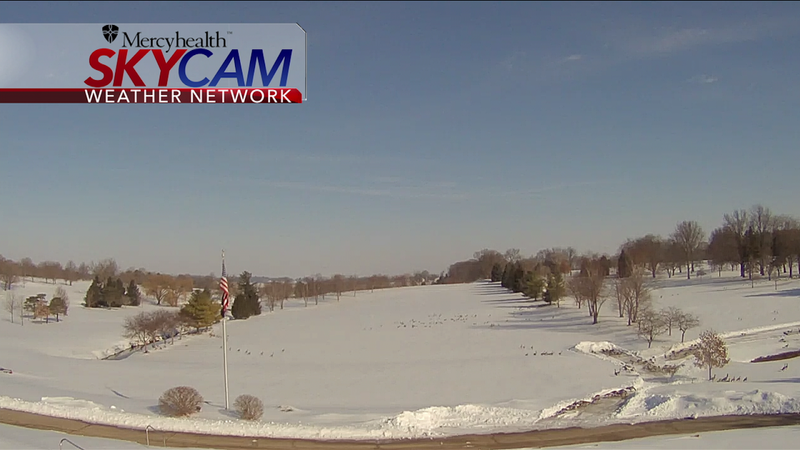 However, Fort Dodge is reporting some light snow over the last several hours. 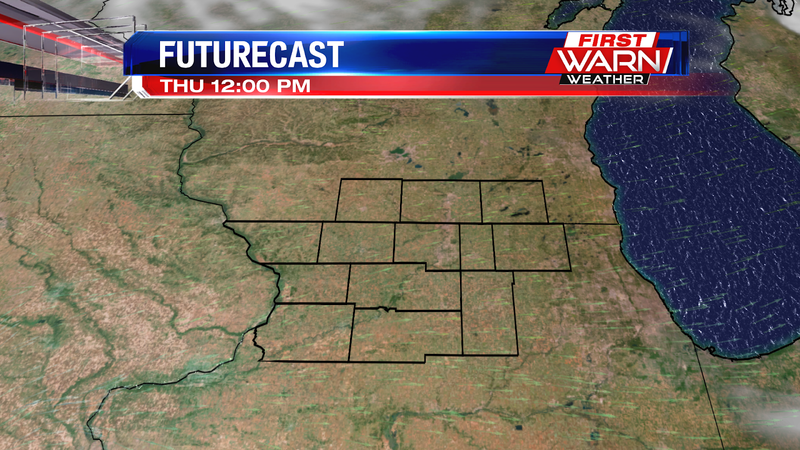 After a chilly start this morning, we should make it into the low-mid 20s this afternoon. 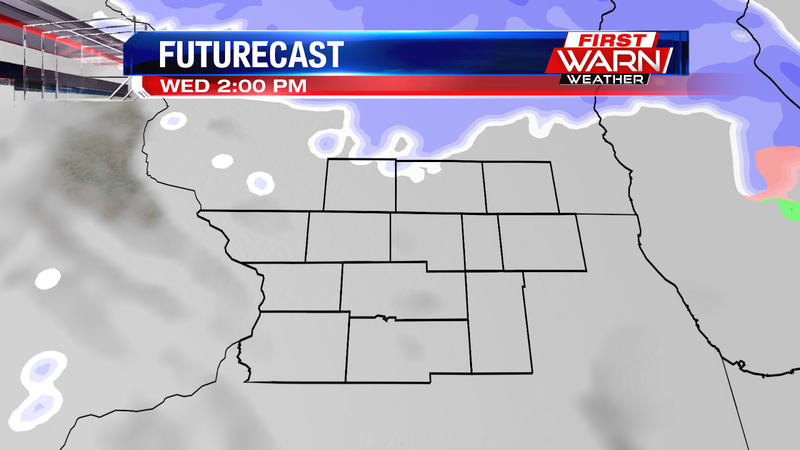 We'll warm up into the lower 30s tomorrow with a better chance for snow during the later afternoon and evening hours. 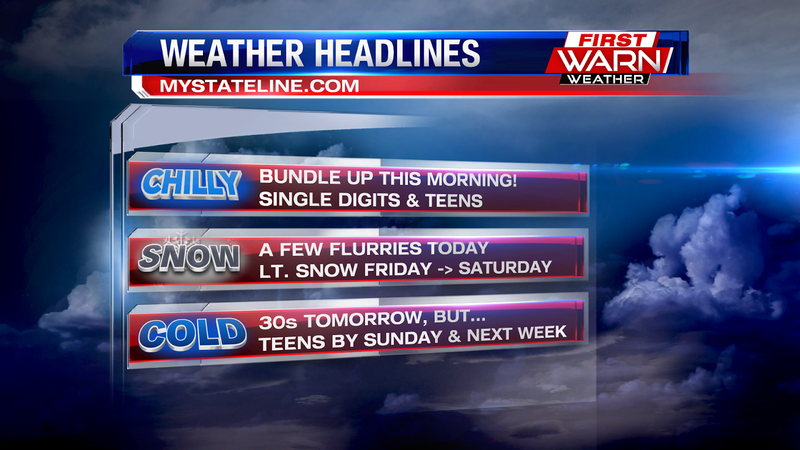 After tomorrow, temperatures begin to tumble. 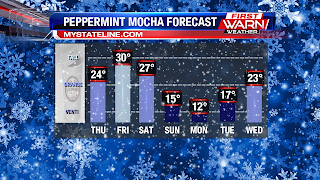 By Sunday and early next week highs will be in the teens with overnight lows in the negative single digits. We could be dealing with record cold to start off March. It doesn't look like the cold ends there. 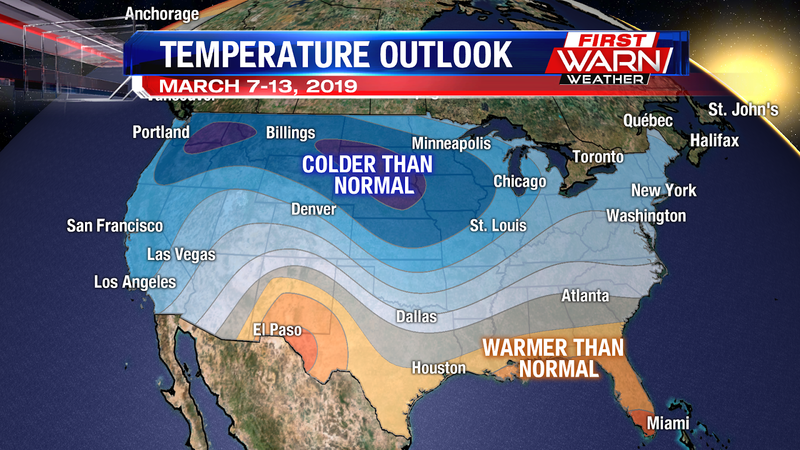 Our long range temperature outlooks show colder than normal conditions for a wide swath of the county, including here in the Stateline, as we go into early/mid March. You'll have to go down to the Gulf of Mexico to find warmer than normal conditions. 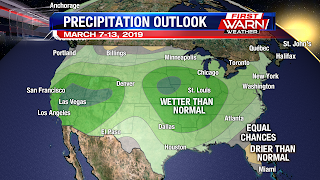 During that same time period, the long range outlooks are pointing towards wetter than normal conditions across not only the Stateline, but a majority of the county. 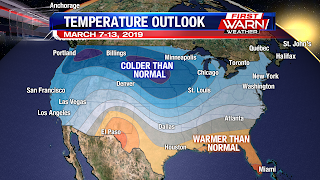 Below average temperatures have been very common during the month of February and it looks like the beginning of March isn't going to disappoint. Highs Wednesday only warmed into the low 20s, a good ten degrees below average for this time of year. High pressure moving down the Plains Wednesday night will keep temperatures on Thursday from warming much past the mid 20s during the afternoon. An even stronger high pressure system late Sunday night and early next week will help pull down an even colder air mass into the first week of March. High temperatures Sunday, Monday and Tuesday of next week will have a hard time making it out of the teens! 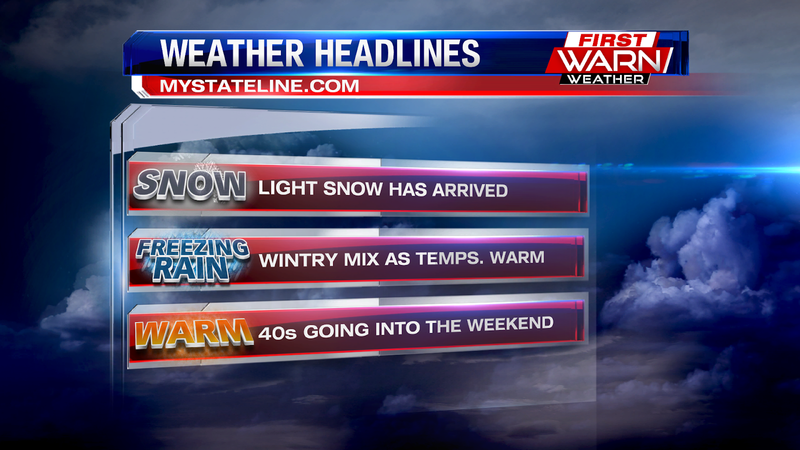 Keep in mind average highs should be in the low 40s. 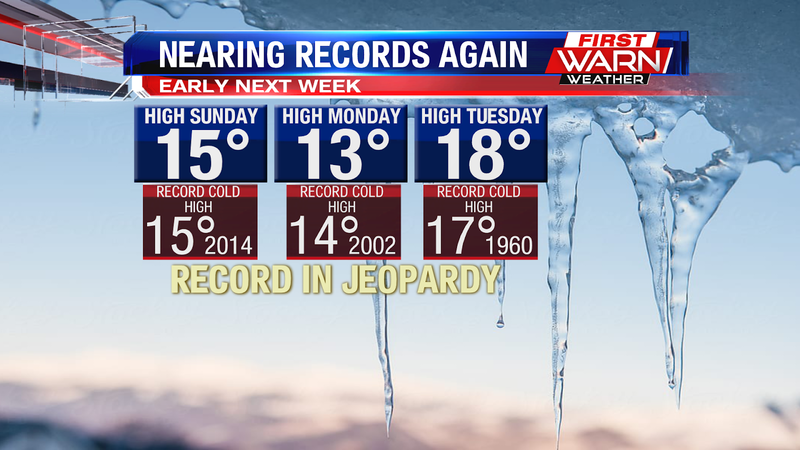 In fact, some of the cold next week could be record setting. Next Sunday through Tuesday have the potential to either tie, or break, the record cold high temperatures for those days. The forecast high temperature for Sunday is 15 degrees. If that forecast holds it'll tie the record cold high of 15 degrees set back in 2014. The forecast high for Monday is 13 degrees. This could actually break the record cold high temperature for that day which was 14 degrees set back in 2002. 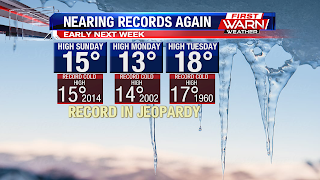 And Tuesday's high of 18 degrees could also come close to tying the record cold high of 17 degrees set back in 1960. It doesn't look like any record lows will be set next week. Which is a good thing! Unfortunately the cooler than normal trend looks to continue into the middle of the month before a possible pattern change that could lead temperatures back up closer to where they should be. 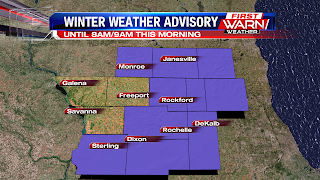 9am UPDATE: The Winter Weather Advisory has been allowed to expire. 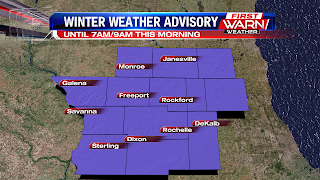 UPDATE: Stephenson, Jo Daviess and Carroll Counties have been dropped from the Winter Weather Advisory, but the rest of the viewing area remains under the advisory until 9am. 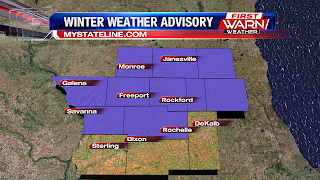 A Winter Weather Advisory is in effect for the entire Stateline area until 7am for the western half and 9am for the rest of the area. 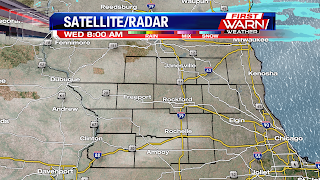 Freezing rain and light snow has created some slick spots this morning. 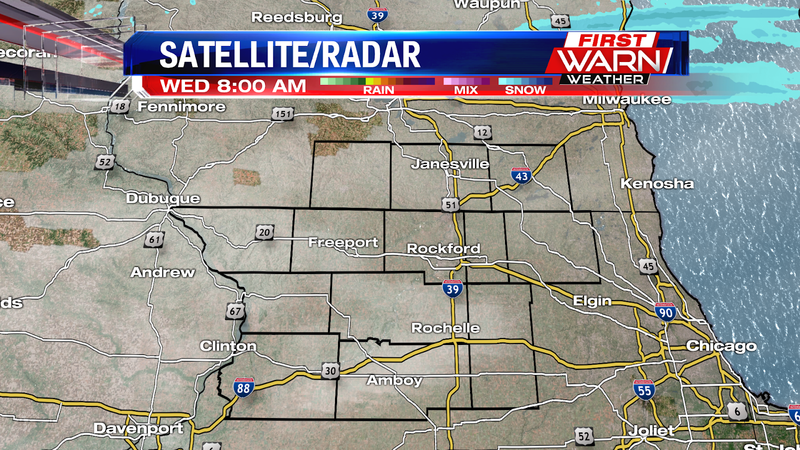 Freezing drizzle and light snow is tapering off, but has left some slick spots across the Stateline. 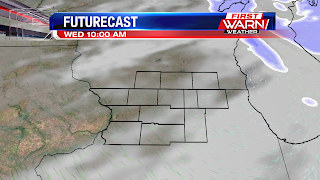 The clouds will stick around throughout much of the day before turning partly-mainly cloudy tonight. Temperatures are in the teens and twenties this morning. With wind chills in the single digits and teens. So bundle up as you head out the door this morning. Main and secondary roadways will continue to be slick throughout the morning hours even after the freezing rain/light snow ends. Even with just a glaze of ice, we've received numerous reports of accidents and cars into ditches. 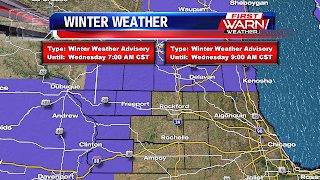 A Winter Weather Advisory has been issued for Green, Rock and Walworth counties in southern Wisconsin, as well as for Stephenson, Jo Daviess, Carroll and Whiteside counties until early Wednesday morning. Light freezing rain and freezing drizzle has been reported across parts of eastern Iowa, already producing a light glaze of ice on untreated surfaces. 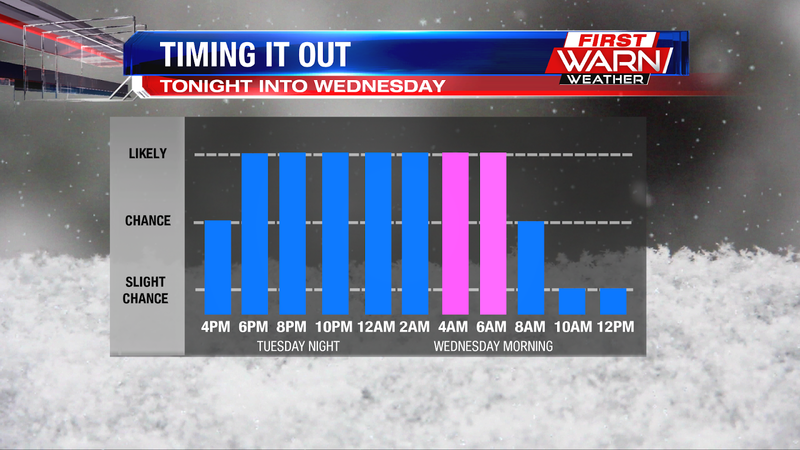 Light snow showers will also mix with some of the freezing drizzle during the overnight leading to slick roads by Wednesday morning. Snow accumulations will remain minor and under an inch in most locations, although totals could be a little higher across southern Wisconsin. 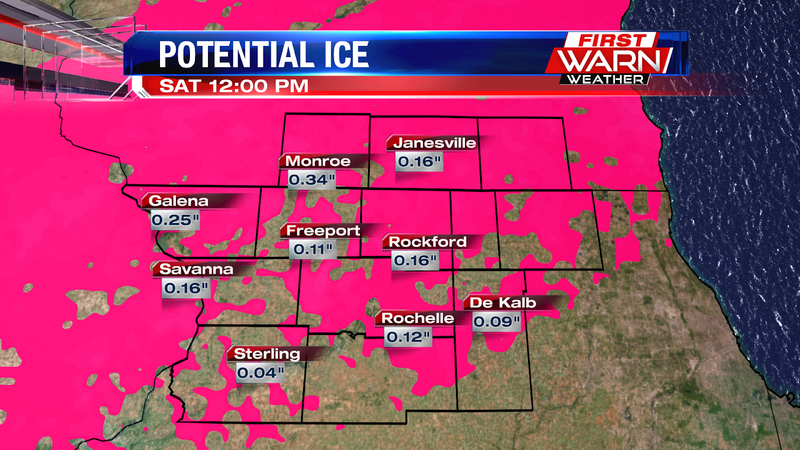 A minor glaze of ice is expected on untreated surfaces. 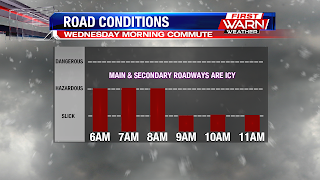 Take it slow on the commute if you head early Wednesday morning. Forecast models through Wednesday morning hold on to a higher chance for more freezing drizzle, rather than snow, which would cut down on some snow totals over the area and increase the likelihood for minor ice accumulations. Good morning Stateline! 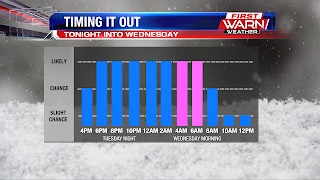 The main weather story in today's forecast is that we have snow arriving late this evening that will last through the early morning hours on Wednesday. We can time that out for you here using futurecast. 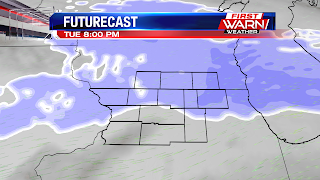 Stopping the clock at 8 PM this evening, light snow has moved into the northern parts of our region. 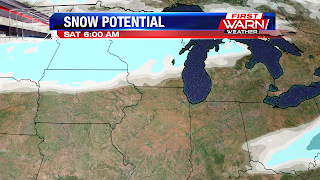 The way this system is tracking will allow most of the heavier accumulation to stay to our north. 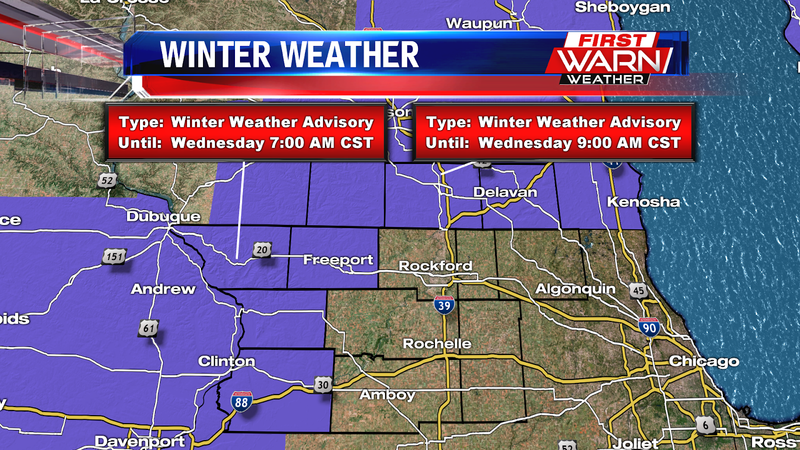 Light snow becomes more widespread overnight and will continue into Wednesday morning. There is a time period when we could see a wintry mix come into play. Mainly between 3 AM and 7 AM. 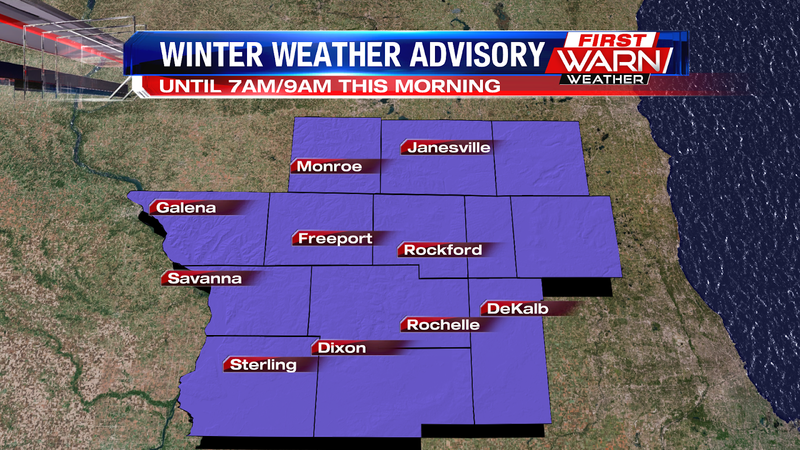 So this could make for slippery conditions out on the roads for the morning commute. 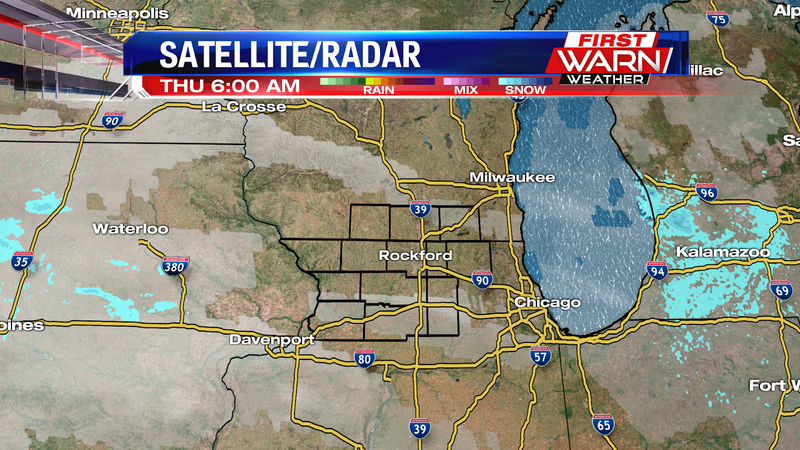 We will see lingering flurries last into the morning hours. 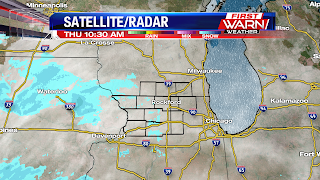 As we head closer to noontime, the snow chances will slowly diminish as the system moves to the east of the area. 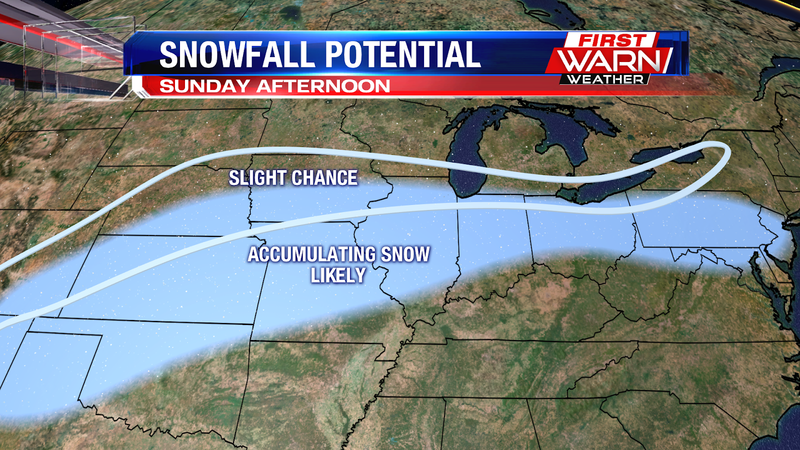 Overall, we don't expect much accumulations with this system. 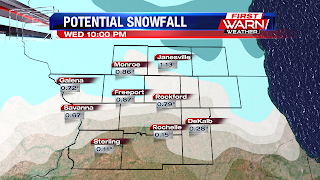 About a dusting to 1" of snow is expected across the viewing area. For our counties in southern Wisconsin (Green, Rock, and Walworth), you could expect about 1" to 2" when it all said and done. Also, breezy conditions will make their way into the viewing area tomorrow. 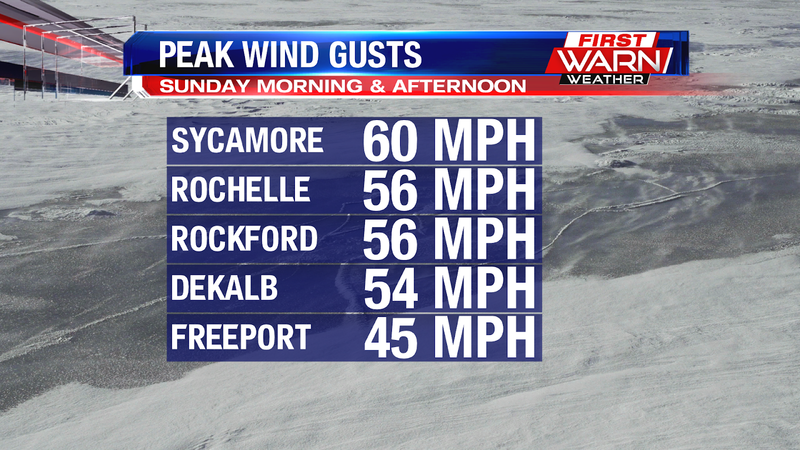 Now, we won't be seeing wind gusts near 60 mph like we did Sunday afternoon. 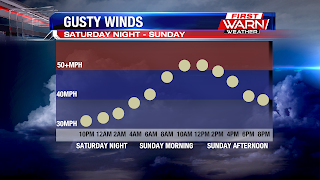 Winds tomorrow generally will be gusting around 20 mph at times. The overall pattern remains active for the last few days of February. 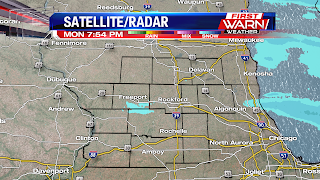 Light snow showers are showing up on radar over Wisconsin and Illinois, but very little of that is actually reaching the ground due to dry air in the low levels of the atmosphere. Actually, over the past couple of hours the snow has been decreasing in overall coverage. Skies will remain mostly cloudy through the night but a weak disturbance rippling through the flow in the jet stream will allow a few additional light snow showers to develop overnight Monday into Tuesday morning. A stronger disturbance moves in from the west Tuesday afternoon and this will bring a better chance for snow showers late in the day Tuesday and Tuesday night. 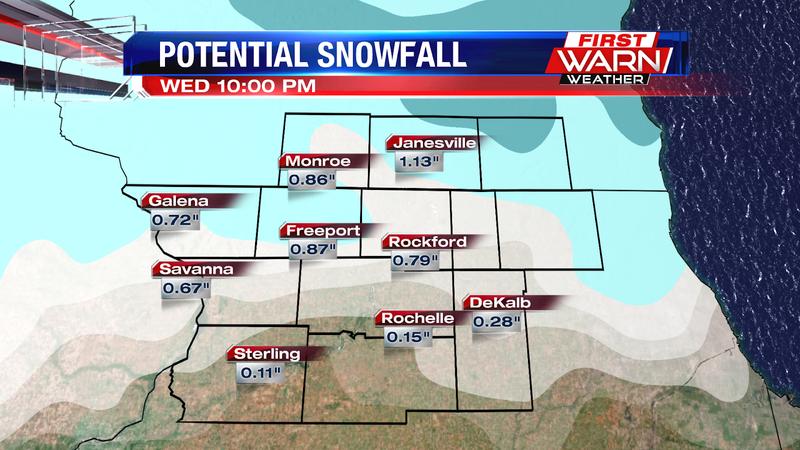 This round of light snow could bring a better chance for minor accumulations heading into Wednesday morning. 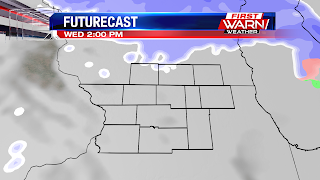 High pressure then briefly moves in Wednesday before another disturbance moves through Thursday with a chance for light snow Thursday afternoon. 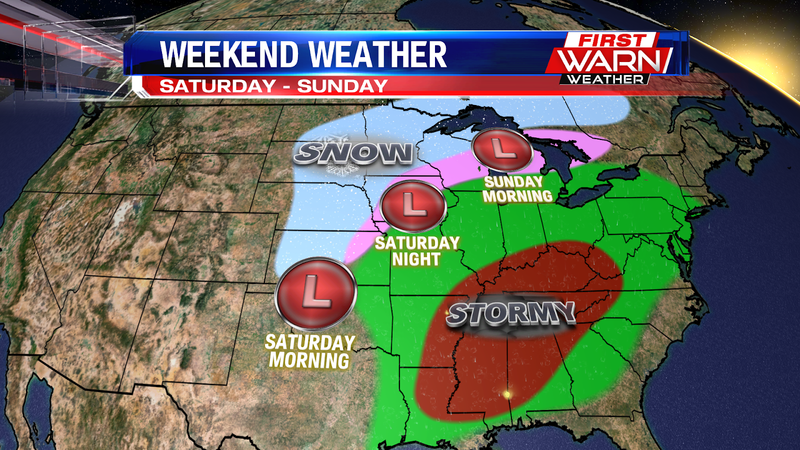 A bigger storm system arrives late Friday into Saturday with a couple inches of snow possibly by Saturday afternoon. 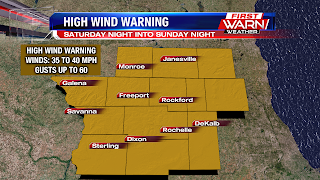 The High Wind Warning is no longer in effect for Stateline, but winds are still gusting close to 45 mph and will continue to remain blustery through Midnight. 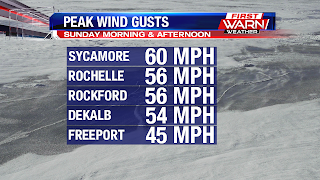 Peak wind gusts Sunday afternoon reached as high as 60 mph in Sycamore, with Rockford clocking a peak wind gust of 56 mph. night. 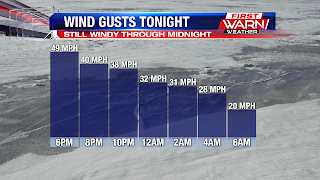 Wind gusts around Midnight will still be around 30 mph, falling to around 20 mph by sunrise Monday. Good evening Stateline! It's been a very busy day weather wise. To start things off, we had our first thunderstorm of 2019 earlier this evening. 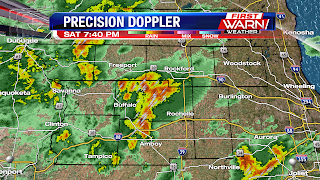 This storm moved through Lee county, Ogle county, and right over the city of Rockford. 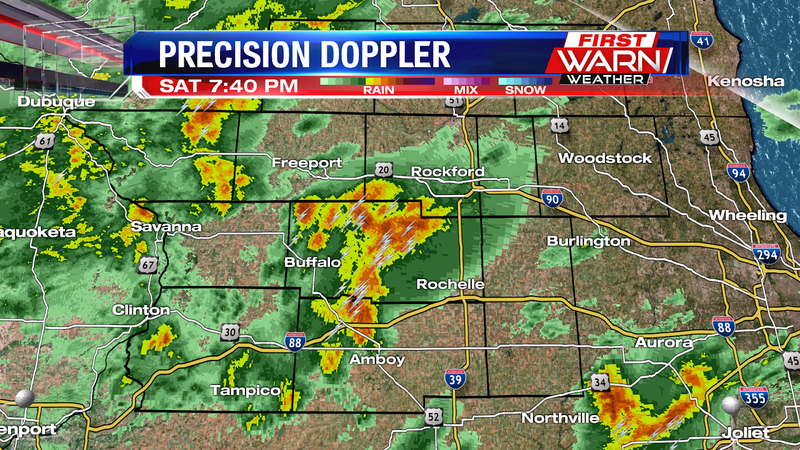 A lot of lightning associated with this storm as well as some dime to nickel sized hail! 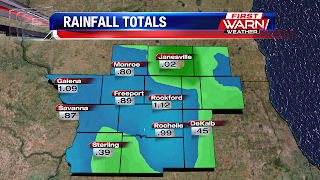 Many spots across the viewing area a close to an inch of rain. 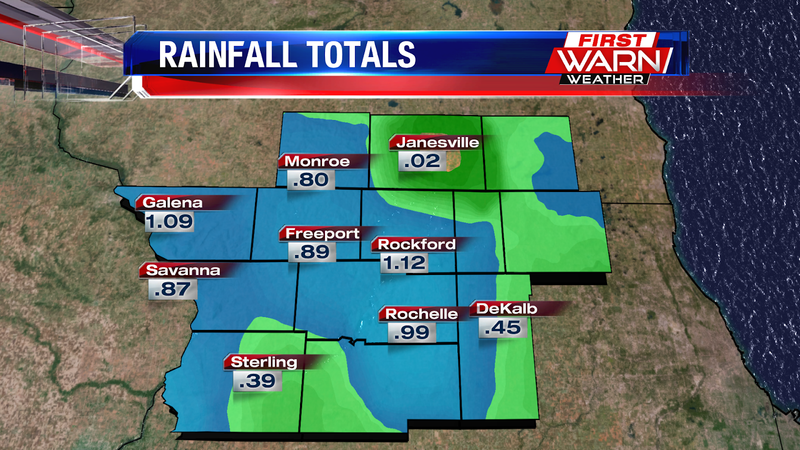 Some spots including Rockford , and Galena have eclipsed the 1" mark. 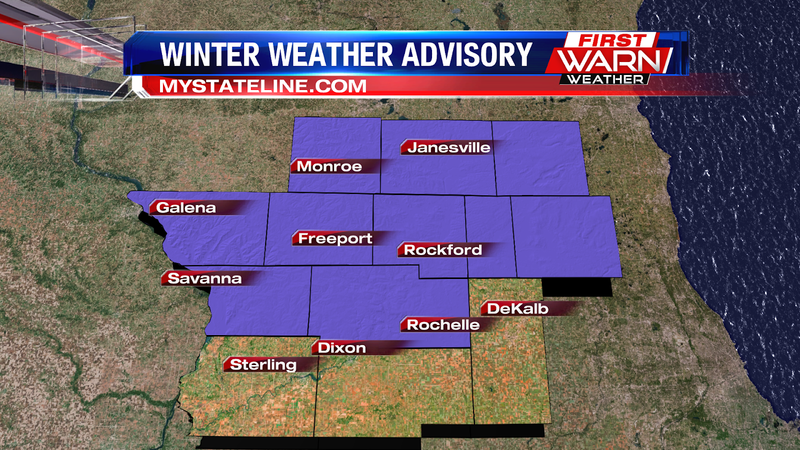 Rockford right now at 1.12" and Galena is at 1.09". We still have a chance for some rain tonight before a cold front moves through early tomorrow morning and switches the rain over to a light snow. 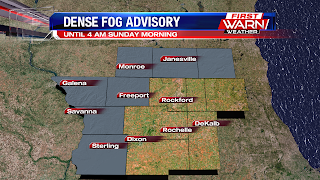 A dense fog advisory is in effect for our Southern Wisconsin counties as well as our Western counties including Rock, Green, and Walworth, Jo-Daviess, Carroll, Whiteside, and Stephenson counties. 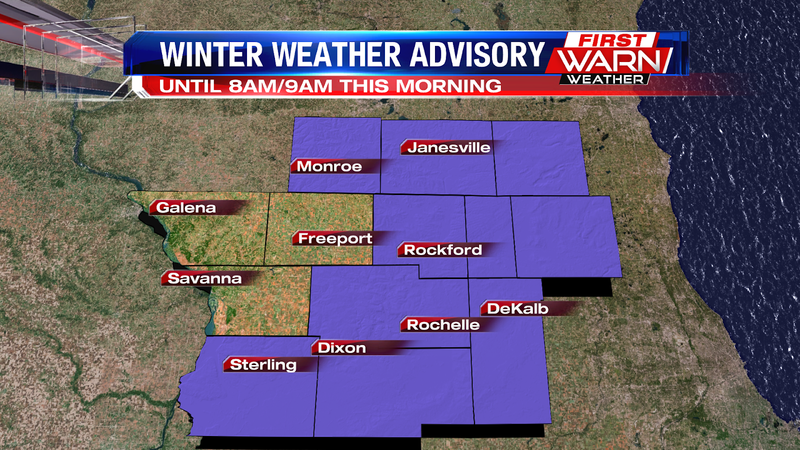 This advisory will stay in effect until 4 AM. Visibility will drop to about 1/4 of mile at times tonight. 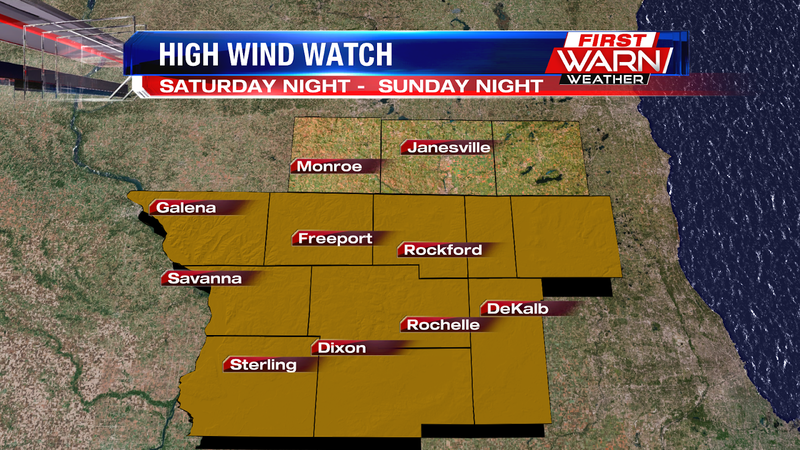 After that expires, a High Wind Warning will go into effect for all of the counties in the viewing area. This warning will stretch through the day tomorrow into the evening hours. 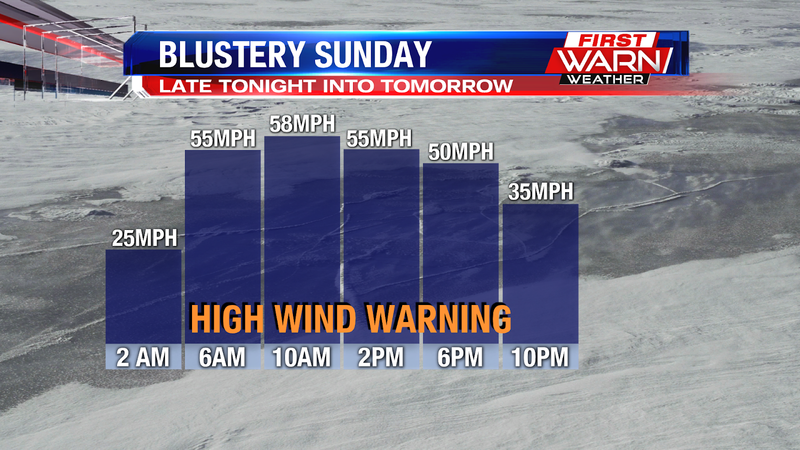 Winds throughout the day tomorrow could gust up to 60 mph at times. Here is a timeline of when we can expect the highest wind gusts. 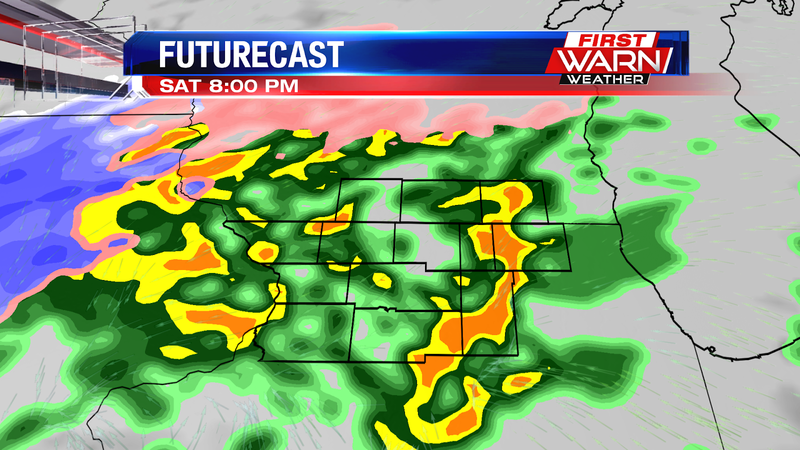 Between 2 AM and 6 AM, a cold front is set to come through the Stateline. After 6 AM is when we could see wind gust up to 55 mph and then up to 60 mph by 10 AM. Winds should start decreasing throughout the afternoon and evening hours tomorrow. We still expect gusty winds heading into Monday morning. 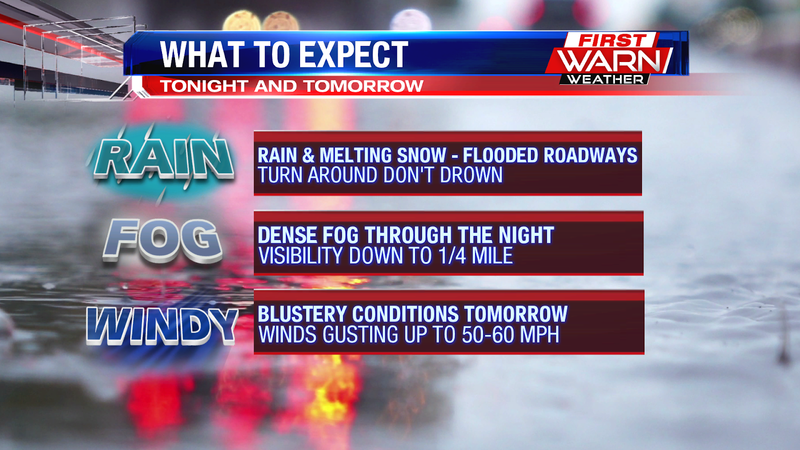 So here is what to expect as far as impacts onight into tomorrow. 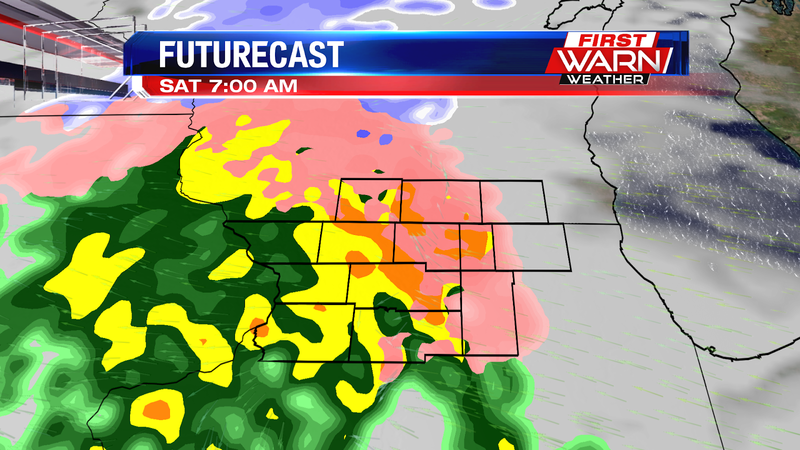 We still have a chance for some rain heading into the early parts of tomorrow morning. That along with the melting snow could cause roadways to flood. If you come across a flooded roadway, turn around and don't drown. After abundant sunshine today, clouds built in throughout the evening hours. 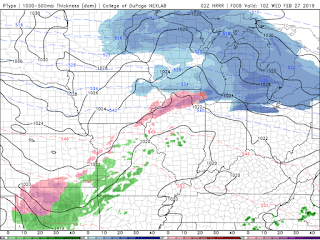 That is in advance of freezing rain to arrive beginning after midnight. 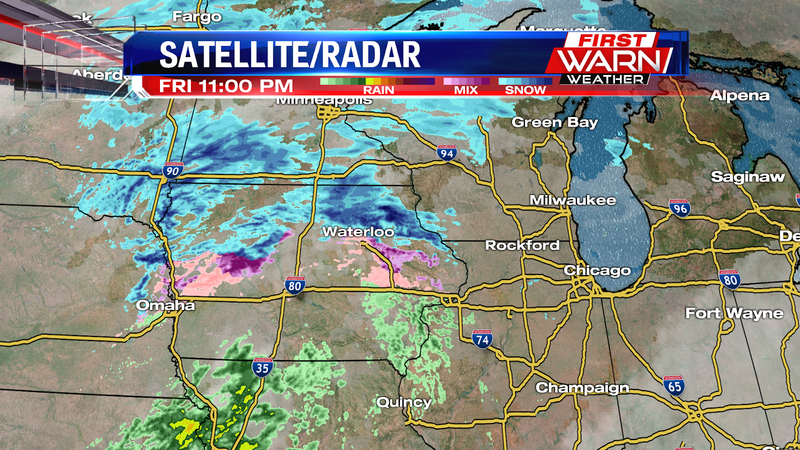 The mixed bag of precipitation is on our door step, and will be moving in over the next several hours. 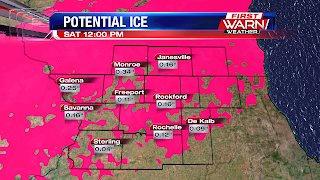 Freezing rain will continue to be likely during the morning hours before temperatures warm above the freezing point. Temps will continue to warm slightly above average into the upper 30s and lower 40s for high temperatures. 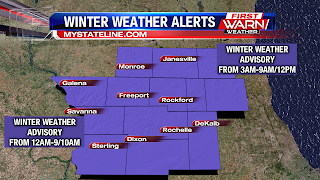 Because of the freezing rain tonight and into early Saturday, the National Weather Service has issued a Winter Weather Advisory beginning at 12am for Stephenson, Jo Daviess, Carroll and Whiteside Counties and goes until 9/10am Saturday morning. 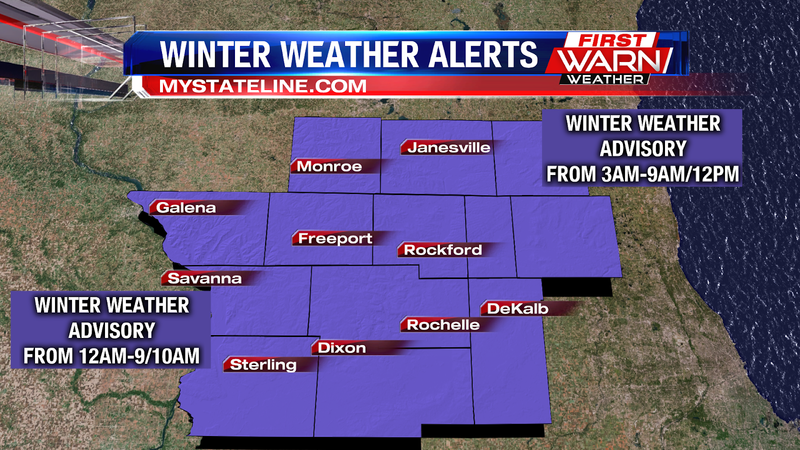 The eastern half of the Stateline goes under the Winter Weather Advisory beginning at 3am Saturday morning. Upwards of a tenth to two tenths of an inch of ice is possible before temperatures warm and it transitions over to all rain. 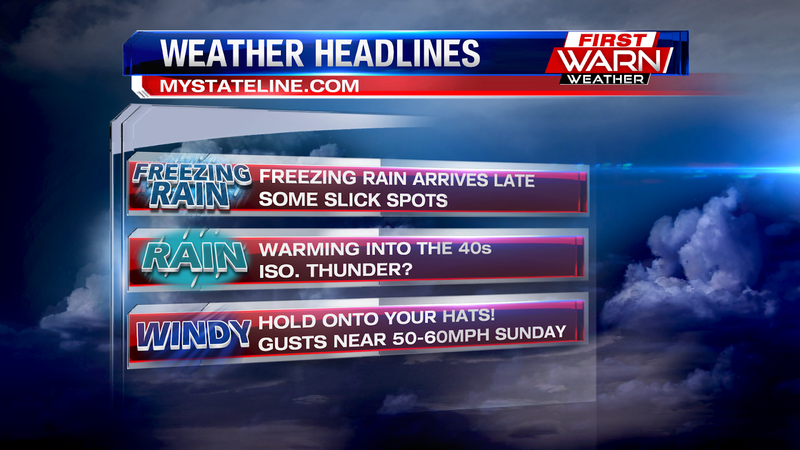 Behind tomorrow's freezing rain, rain and warmth is going to be very blustery conditions. Wind gusts Saturday should range anywhere from 30-35mph, but into Sunday wind gusts will top out in the 50-60mph range. 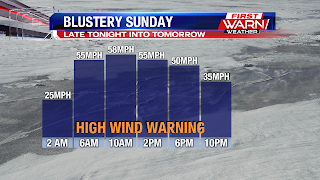 Some of the strongest winds Sunday will be during the morning and afternoon hours. Power outages are definitely possible. 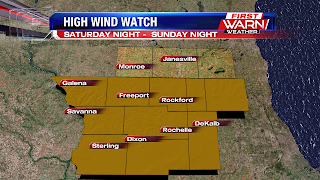 As a result of the very blustery conditions, a High Wind Watch goes into effect Saturday night and goes until Sunday night. Good morning Stateline! Starting off the morning with lots of sunshine due to high pressure overhead. 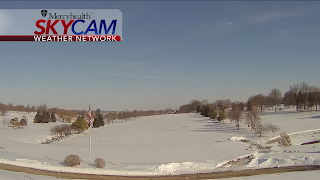 As you can see using our skycam over the Freeport golf course, blue skies with a few passing clouds. Temperatures today will top out in the low 30's. 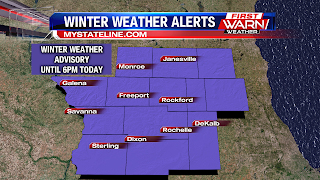 A winter weather advisory will start to go into effect around midnight tonight for Green, Rock, Walworth, McHenry, Boone, Stephenson, Jo-Daviess, Carroll, and Ogle counties. Those will continue into the morning hours on Sunday as slick driving conditions are possible with the threat for freezing rain early on. 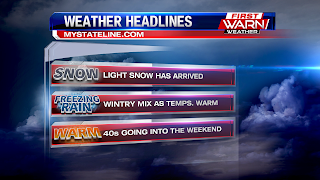 Up north where temperatures are a few degrees cooler, you may see sleet or snow mixing in. Regardless, expect slick conditions tomorrow morning. 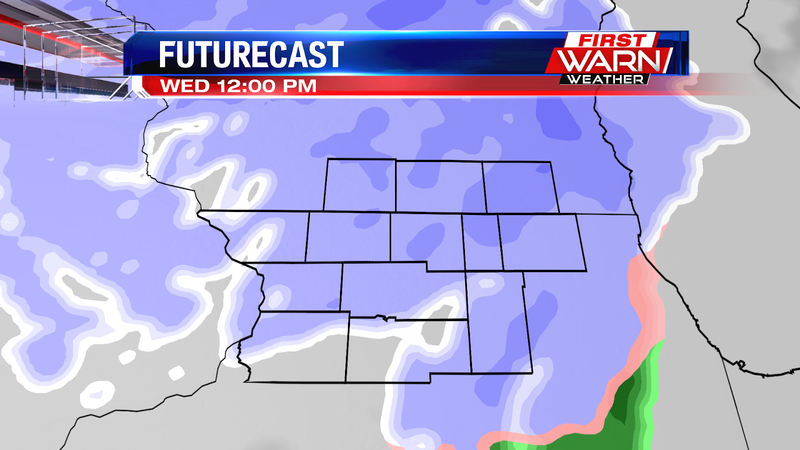 Taking a look at futurecast. We stop the clock at 7:00 AM and all of that pick shading is freezing rain. 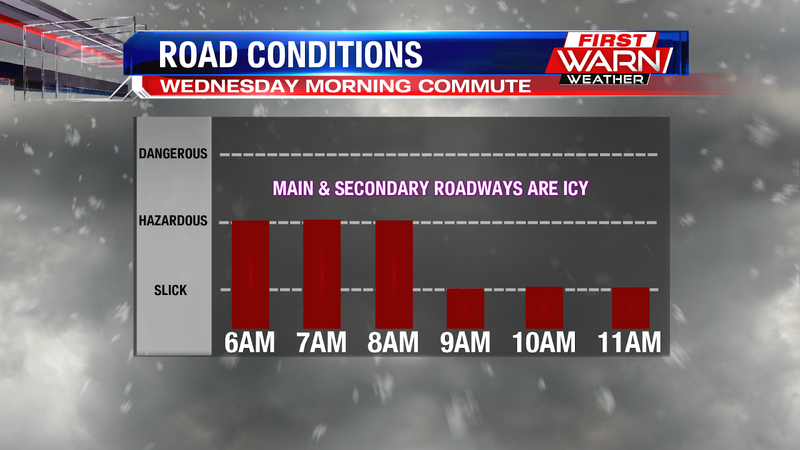 Freezing rain easily freezes on contact with any surface so roads will be slick early on in the morning. As temperatures slowly rise into the upper 30's-low 40's tomorrow, it will transition to mostly rain and a few rumbles of thunder are possible. 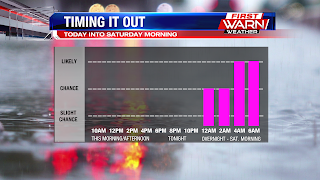 After the first wave passes through early tomorrow morning, we have a small break heading into the afternoon before more steady rain moves in after 4:00 PM. 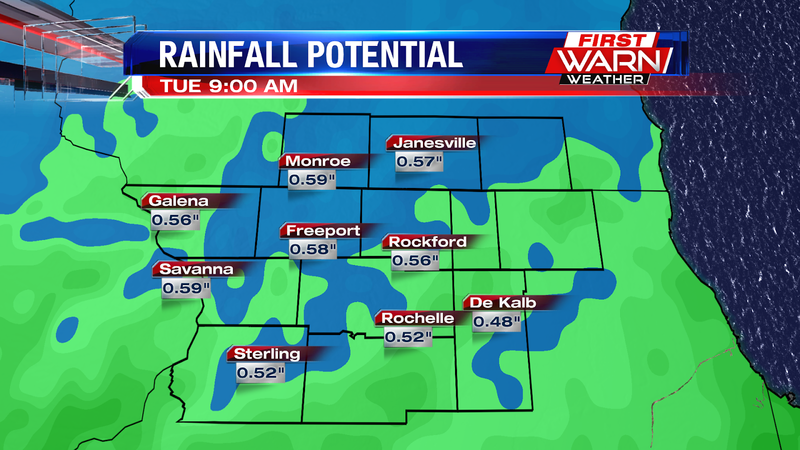 Overall, much of the area should see about a half an inch of rain from this system. 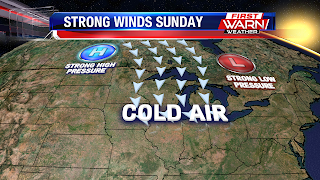 After this system moves into the Great Lakes region, the associated cold front will bring blustery conditions and cold temperatures to the region. Winds gusting up to 40 to 45 mph are possible and that is strong enough to cause tree damage as well as minor power outages. 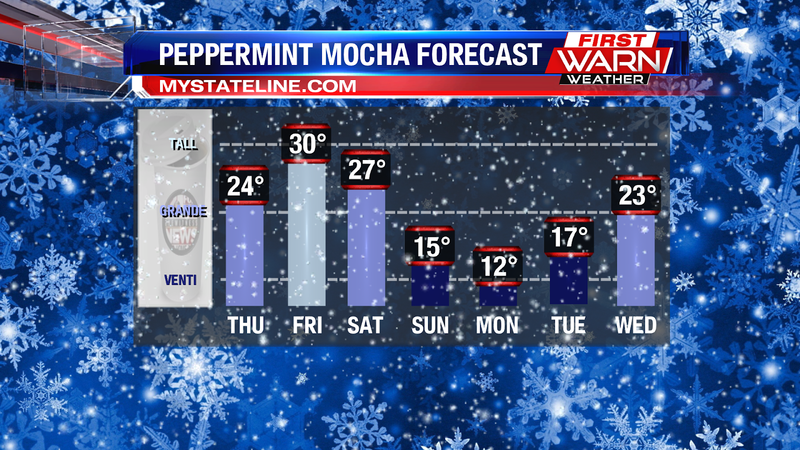 Temperatures look to drop into the 20's for the start of the work week! High pressure will settle into the Plains and Midwest during the afternoon Thursday before pulling off to the east by Friday afternoon. Temperatures will warm into the mid and upper 30s Thursday and Friday. Low pressure will develop over the southern Plains late Friday night/Saturday morning, lifting into the mid-Mississippi River Valley Saturday afternoon. Strong winds in the lower part of the will push temperatures into the upper 30s and low 40s Saturday, holding temperatures in the 30s through Sunday morning. 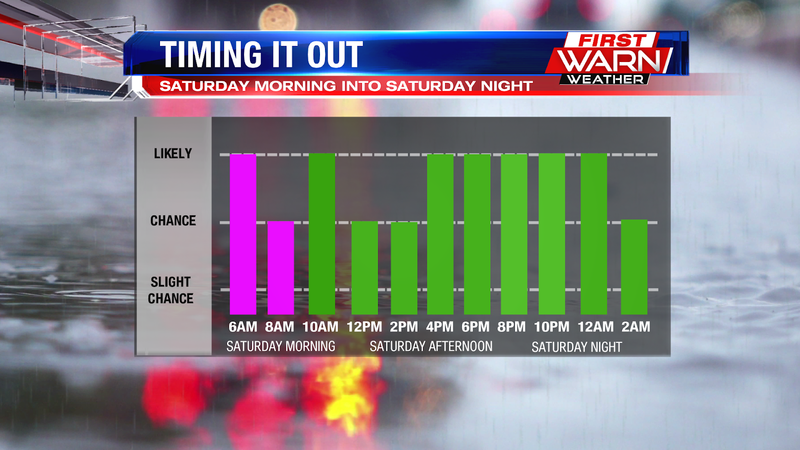 There is a chance for light freezing rain late Friday night into Saturday morning before the precipitation changes over to rain during Saturday afternoon. 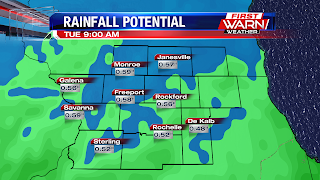 Rainfall totals could reach half inch across northern Illinois and southern Wisconsin. 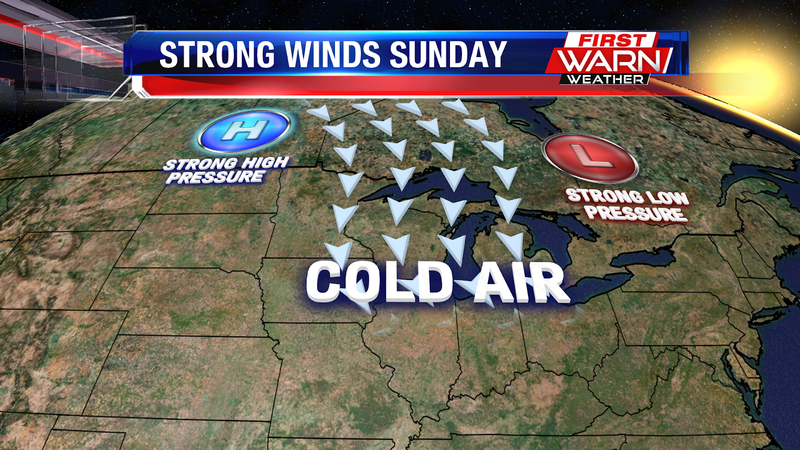 Low pressure will then pass through the Great Lakes before moving into the northeast Sunday afternoon. As it does, the low will strengthen quite a bit causing winds to quickly increase Saturday night and Sunday. 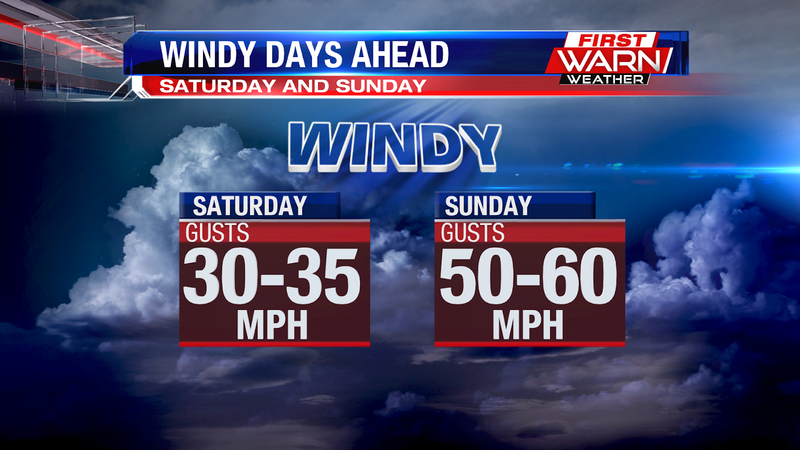 Wind gusts could be as high as 40-45 mph during the afternoon. Colder air will get wrapped in behind the low during the afternoon Sunday, bringing temperatures down into the teens by Sunday night. 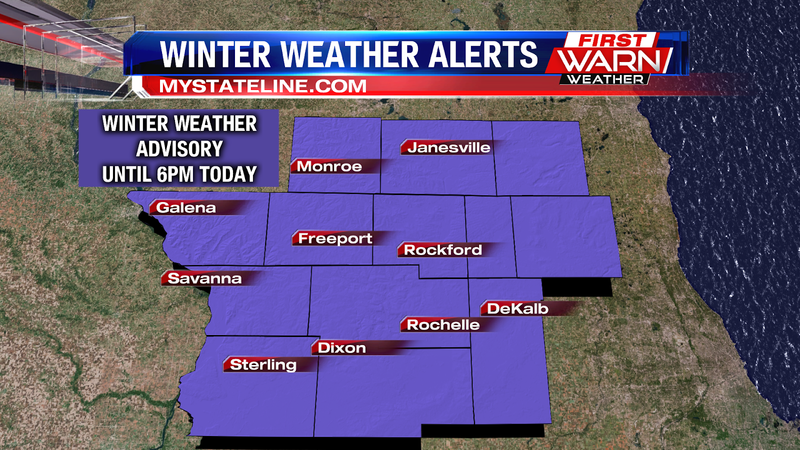 A Winter Weather Advisory continues until 6pm for the entire Stateline area because a wintry mix is continuing to fall across the area. 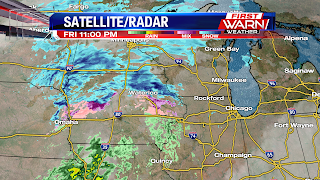 The mixed precipitation should continue into the early afternoon hours. 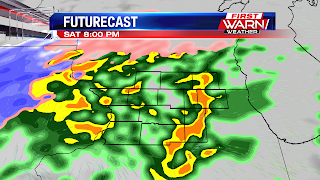 The wintry mix will taper off later on to just some patchy freezing drizzle and light rain. Decreasing clouds overnight tonight and into Thursday. 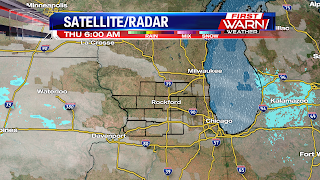 As clouds move out, skies should becoming partly to mainly clear. Sunshine will build in tomorrow and Friday, as high pressure slides to our south. If you're not enjoying the wintry mixture, like Tammie who sent in this picture of her drinking coffee while watching the snow fall... we'll be warming it up, and Saturday should see highs into the 40s.